The WHL provides the top young talent in the west with the opportunity to develop their skills on the ice at the highest possible level, without compromising their academic goals. The WHL is committed to recognizing academic excellence. Awards are presented annually to the WHL’s Scholastic Player and Team of the Year. A player is able to attend any post-secondary or career-enhancing institution of his choice, including universities, colleges, technical institutes, trade schools, or any other institution which will help the player achieve his academic and career goals. The WHL Scholarship is guaranteed to the player through him and his parent or guardian signing a WHL Standard Player Agreement, provided he does not sign a professional hockey contract in the NHL. Players are allowed to play minor professional hockey (AHL, ECHL, etc.) before he must activate his scholarship, within 18 months of his junior eligibility ending. The WHL is also a leading supplier to U SPORTS hockey programs. Each year, more than 200 WHL Scholarship recipients further their education while playing elite hockey at the U SPORTS or collegiate level across Canada. In partnership with Canada West universities, more than 125 WHL Scholarship recipients each year are also awarded additional financial assistance from their university to receive Western Canada’s Premier Hockey Scholarship. Each year, more than 375 WHL graduate players attend post-secondary institutions on full WHL Scholarships at over 80 different institutions across North America. In 2018-19, a WHL-record 405 graduate players accessed their WHL Scholarship. Since 1993, the WHL has awarded over 6,000 scholarships to graduate players representing an investment in excess of $25 million by WHL Club Ownership. The WHL is the leading supplier of scholarships in Western Canada and offers one of the most comprehensive scholarship in North America. The 2018-19 Dr. W.G. 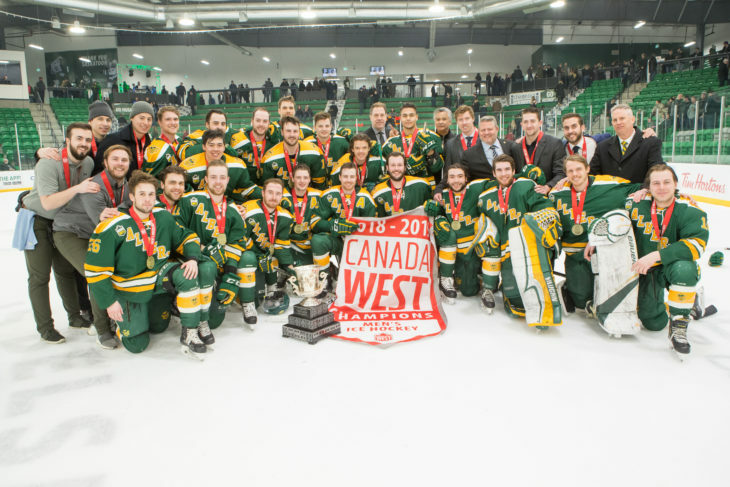 Hardy Trophy-winning University of Alberta Golden Bears. While playing in the WHL, all players have access to post-secondary courses through various universities, colleges, and virtual schools. As part of the comprehensive WHL education program offered to all players, tuition and textbook costs for these courses are covered by WHL Clubs. These costs, however, do not impact WHL Scholarship benefits available to the player upon graduating from the League. Each year, more than 150 WHL players enroll in post-secondary courses while playing in the WHL. Athabasca University offers fully accredited and flexible courses online, allowing WHL players to combine their university studies with their hockey schedule. This partnership gives every current WHL player extensive access to career enhancing studies, giving them a head start to full time studies upon graduation from the WHL. Calgary, Alta. – The Western Hockey League announced today that a total of 405 WHL graduate players have been awarded WHL Scholarships for the fall and winter semesters of the 2018-19 academic year. 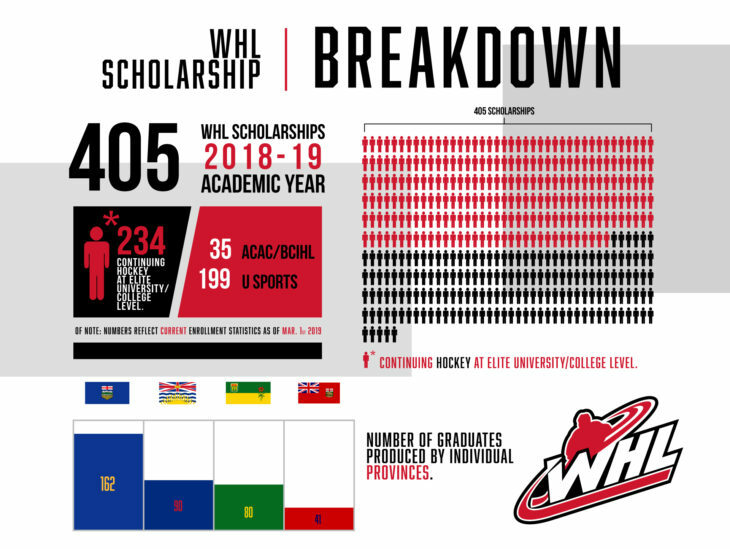 The 405 WHL Scholarships awarded represents the highest total for any academic year in WHL history, improving upon the mark of 382 set during the 2017-18 season. The 2018-19 season marks the 25th anniversary of the WHL Scholarship program. Established on a league-wide basis in 1993-94, over 6,000 graduate players have received WHL Scholarships, representing an investment of over $25 million by WHL Clubs. This season, WHL Clubs will contribute in excess of $2.6 million to the 405 WHL graduates utilizing the WHL Scholarship.